Britain's Parliament has approved a law that will make it illegal to take so-called "upskirting" photos — thanks largely to the efforts of 26-year-old Gina Martin. 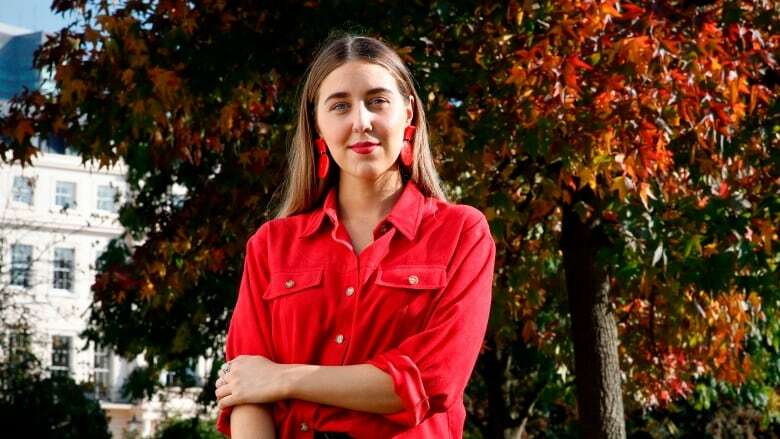 Gina Martin, 26, has spent the last two years of her life fighting to make it illegal to take "upskirting" photos. When Britain's Parliament finally approved the law on Tuesday, she said it took her a few minutes to absorb her hard-fought victory. "I kind of just smiled and carried on as normal, and then I turned around to my mom and she was crying her eyes out," Martin told As It Happens host Carol Off. "And that's kind of when it hit me that it was quite a big thing to do, and now I'm starting to feel proud of myself." The law, which makes the practice of snapping surreptitious photos up people's skirts a sexual offence, will take effect as soon as it achieves royal assent from the Queen. Martin's battle started when she was at a music festival in London's Hyde Park in 2017 with her sister. "This group of guys were kind of, I guess, hitting on me and trying to get my attention. They were being quite rude, and I said no as many times as I could without getting angry," she said. "I felt one of them brush up against me, but I didn't think anything of it because we were in a crowd." Then she saw it — a photograph that one of the men had snapped from beneath her skirt using his phone. She immediately swung around and snatched the phone from his hand, she said, and started to shout about what he'd done. The crowd came to her defence, holding the guy off so she could run with away with his phone and bring it to police. "When I got there, I handed the phone and the picture and him in as well, because he'd followed me, and they kind of said, 'Sorry, there's nothing we can do about this,'" she said. Shocked, she went home and did some research and learned that upskirting wasn't considered a sexual offence in England and Wales, and that there was nothing on the books that would allow authorities to easily prosecute it. "That's when I realized, OK, we need to update the law here, we need to change it," she said. She teamed up with a law firm that took on her cause for free, and they proceeded to lobby lawmakers "one by one," she said. "We managed to get MPs and politicians and ministers from every party to agree with us — and that's what really made the difference, because there's not many things in British politics right now that everyone agrees on, you know," she said. She garnered more than 500,000 signatures on a petition. It took her a day and a night to read all the comments from other women who had similar experiences. "Immediately, I knew it was a way bigger problem than we'd given it credit for," Martin said. "And then I started receiving stories as well, and that really bolstered me to keep going." The path toward approval was complex because the proposed law was first introduced by a legislator interested in Martin's case, not by the government. A private member's bill can be choked off by a single objection in Parliament. That happened in June when Conservative Party lawmaker Christopher Chope objected. He later said he supported Martin, but objected in principle to private members' bills being brought before Parliament on a Friday without enough time for a full debate. U.K. Prime Minister Theresa May's government decided to introduce the measure, giving it the backing needed to sail through Parliament. "He kind of helped in terms of objecting to it, because it made people care about it way more," Martin said. Martin said she was compelled to take on this fight because she was tired of excusing harassment in her daily life. "Like, walking down the street and someone yelling something from a car, or being in a bar and someone smacking my bum or, you know, some guy asking me out and me saying, 'No, I'm OK, thank you,' and him not taking no for an answer," she said. "It'd been too many instances where I'd kind of go, 'OK, I'll brush it off, that's just life,' and I think something kind of snapped in me this time and I just went, 'Do you know what? I'm not doing this again.'" The law will apply in England and Wales. The practice is already banned in Scotland. Written by Sheena Goodyear with files from Associated Press. Interview with Gina Martin produced by Sarah Jackson.